Is there a shampooer? If the shampooer is a different person than the stylist, then it is good form to tip her or him as well. Three or four dollars is appropriate, especially if they give you a neck rub, but if they are too rough or get soap down your back, one or two dollars is suitable. If possible, handing the money directly to the shampoo person is the proper way to do this as it shows them you appreciated their service. Type of Service How complex was the service you had done? This is another point to consider when tipping your hair stylist or hair dresser. Did you have a cut, particular coloring for fine hair and a glaze? If your stylist has spent the last four hours with you, perfecting the tapering of your layers and highlighting with three shades of blonde, consider 20%. Getting a formal or wedding updo for you and your wedding party? Remember that they just spent an entire morning or afternoon with you! Did you get what you are paying for? Did the stylist speak to you about yourself, or ignore you as she chatted to her stylist friend about another stylist? Did he seem attentive and verify that he knew exactly what you wanted? Did she give you an attitude when you told her the left side was longer than the right? These are things you definitely want to consider. Before considering a tip, you need to make sure that the results were worth the price of the service. If you are getting great service from a stylist skilled in working with fine or thin hair, that’s a service worth rewarding! Rapport Just like you, your stylist is a normal person with normal feelings. If you don’t care about tipping well, you should expect that she won’t care about trying to squeeze you in for an appointment or want to give you extra guidance about your style. What if your stylist is also the owner? What many people don’t realize is that when it comes to tipping your hairstylist or hairdresser, unlike staff stylists, the owner isn’t expecting (or relying) on a tip! While he or she will certainly accept one, you needn’t feel like the standard 15% is necessary. However, if you are happy with her work, then you should tip her. Unlike servers in restaurants, however, you are paying for a professional service, which is done by licensed professional. A server may spend a total of a few minutes at your table for a forty-five minute meal, but a stylist gives you continuous attention whether you are there for ten minutes or two hours. 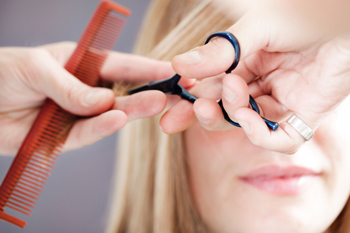 How much you should tip boils down to your overall experience and your relationship with your stylist. While 15% seems to be an informal consensus, you are paying for services that can be pretty pricey, so if this is more than you can afford, do what you can and make sure your stylists knows that you appreciate her talents and that you are happy with her work!